DIRECT BEACHFRONT 10th floor luxury condo at The Pearl. 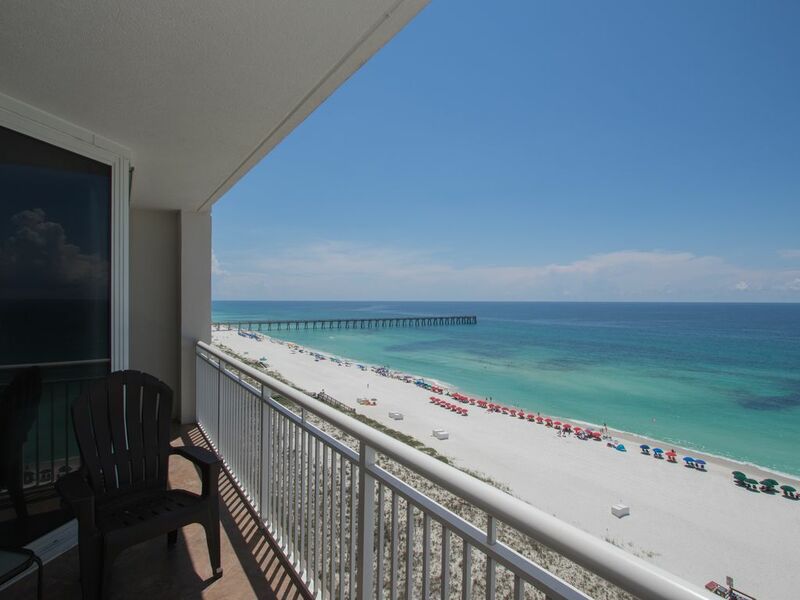 Located minutes from the resort areas of Destin and Pensacola Beach. Navarre Beach is a barrier island with over twenty miles of federally protected, unspoiled and uncrowded sugar white beaches. The Pearl offers: onsite management, fitness center, meeting rooms, heated outdoor swimming pool, hot tub, wet bar, large balcony with spectacular views of the emerald waters of the Gulf of Mexico, 9 foot floor to ceiling glass doors in master bedroom and living room. The entire condominium is well decorated with special attention to detail. Navarre Beach was voted one of the best ten beaches in North America by Boston University. We offer a full money back satisfaction guarantee. Long term winter rates available. Atlanta based executive, husband and father of two. We have been going to Navarre since 1995 and bought our condo when The Pearl opened its doors in 1999. It is a blessing and a slice of heaven. It is impossible to not fall in love with The Pearl the very first time you step on the balcony and see that pure white sugar beach with emerald green waters. Our stay was absolutely perfect. We have stayed in similar condos in Perdido Key and Gulf Shores, and this stood out as our favorite. The beaches were stunning, condo was equipped with everything we needed, pool was nice and warm, and the pearl facility in general was well taken care of. We were able to check out the Gulfarium, rented scooter coupes and cruised the strip, as well as enjoyed some great dining out. So many family memories created throughout our week stay. We will be sure to return. George was very helpful in making the trip so enjoyable - he is responsive and easy to work with! Amazing condo, view, and location! We loved it. It was great. We have spent many a Christmas at the Pearl and have enjoyed them all. Weather was great, the condo was nice, clean and we felt at home. The only issue was that we wish at least one of the pools was heated. The hot tub was nice but the pool was just a little too cool to enjoy. We are very glad you enjoyed your stay again this year. I've sent an inquiry to the HOA as to why the west pool wasn't heated during your stay. It is supposed to be heated year round and I will let you know their response as soon as I hear back. It's always a pleasure to have you as our guest and we hope to host again soon, meanwhile happy new year! The Pearl at Navarre Beach. We loved our room, #1005, the owners were very attentive and helpful. We had a beautiful view, the property could use some vending machines with snacks, working soda machine and ice available, a TIKI bar would be awesome. The pool was nice, the beach was beautiful. I give a 5 to the condo and a 4 to the property. loved staying at the Pearl in Navarre. We have stayed there many times. We especially like the pool. Nice to get off the beach and get in fresh water. Condo was very nice. Had all the amenities we needed. It was a pleasure to have you as our guest and we are glad you had a great time. You and yours are welcome back anytime. The unit was very outdated and somewhat dirty. Many of the lights didn’t work due to burned out light bulbs and the carpet in the master bedroom felt sticky. The beach was nice, however, we felt a little mislead about the chair service. In order to get a chair near the shoreline, you had to pay $30 a day. By July 4th, every chair was rented. Unfortunately we may look for another property next year. Thanks for the feedback. Anything other than a spotless condo is not acceptable so please let me know what specifically was not up to par. The pictures on the listing are current, so again, please clarify what you found as "outdated." The carpet on in master will be steam cleaned immediately and yes, occasionally things get spilled so thank you for letting me know.